The fall of Saigon to communist forces in April 1975, two years after American troops were withdrawn from Vietnam, may have ended the Vietnam War but didn’t end the misery. Hundreds of thousands of people associated with the U.S.-backed, South Vietnamese regime fled the country. Millions more were sent to re-education camps, forcibly relocated within Vietnam, or imprisoned. Some were killed. In neighbouring Laos, Hmong tribesmen, an ethnic minority who had fought alongside U.S. troops, fled their homeland after the December 1975 communist takeover of that country. Three years later, thousands of starving Cambodians crossed the border into Thailand following the Vietnamese invasion of Cambodia, then called Democratic Kampuchea, that toppled the murderous Khmer Rouge regime of Pol Pot. When China retaliated and temporarily invaded northern Vietnam in support of its Khmer Rouge allies, ethnic Chinese living in Vietnam, already viewed with suspicion, were forced to flee. It’s estimated that as many as 1.4 million refugees left their homelands in search of safety between 1975 and 1979. Many more were to follow. While the majority of refugees fled overland, a sizeable minority left by sea. Some paid extortionate fees for the dubious privilege of leaving on crowded, rickety, old boats chartered by human traffickers. Many barely navigable vessels were swamped by rough seas as refugees attempted to make their way across the South China Sea to safety in neighbouring countries. The loss of life was appalling. 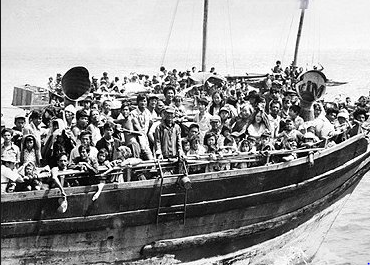 Of the estimated 300,000 “boat people,” as many as one third may have died in transit. Those lucky enough to survive the harrowing sea passage were prey to pirates that robbed and raped the already traumatised people. Their arrival at a safe harbour didn’t end their ordeal. Neighbouring countries, already sheltering hundreds of thousands in refugee camps in appalling conditions, resisted new arrivals. Some boats packed to the gunnels with men, women and children were forcibly turned away within sight of land. With 50,000 refugees arriving monthly, Malaysia, the Philippines, Indonesia, Singapore, and Thailand issued a joint communique in June 1979 saying that they had had enough; they would not accept any more newcomers. In response, the UN called an emergency international conference to come up with a co-ordinated response to the crisis. What started off as an off-hand remark became the rallying cry for action. News of the meeting and the Mayor’s intentions were quickly picked up by the press which ran the story the following day. Initial commentary was sympathetic, though some doubted the city’s ability to absorb so many newcomers. At a press conference, Mayor Dewar, encouraged by the support she had received so far, challenged other cities and the federal government to do more to help the tidal wave of refugees. On 4 July, Ottawa’s city council unanimously supported the mayor’s initiative. A public meeting was held at Lansdowne Park a week later to gauge the extent of the public’s interest. Expecting perhaps 500-800 people, as many as 3,000 people showed up to hear Dewar and experts speak about the situation in Asia, and what they could do to help. Bruce Cockburn, the popular Canadian guitarist, and a choir of Vietnamese children entertained the crowd. Also in attendance in support of the mayor were representatives of faith-based institutions which were already active in settling refugees in Canada. At the end of the meeting, the enthusiastic crowd gave Marion Dewar a standing ovation. The City provided $25,000 to launch Project 4000 which was quickly established as a non-profit organization with a mission to assist Ottawa residents who sponsored a refugee individual or family under the federal government’s private sponsorship program. The new agency, directed by a volunteer board of directors drawn from a cross-section of the community, had a small paid staff of no more than four headed by project co-ordinator, Alan Breakspear. Volunteers ran six committees: accommodation, health, education, employment, media relations, and fund raising. Space downtown for the budding agency was donated by a property development company. Later, Project 4000 volunteers ran clothing and furniture depots for refugees and others in need. A newsletter was also published. Private refugee sponsorship represented a considerable economic and emotional commitment. Sponsors were legally bound to financially support their refugee person or family for up to one year at an estimated cost of $8,000-$12,000 ($25,000-$38,000 in 2014 dollars). In addition to bearing these considerable financial costs, sponsors helped to integrate the newcomers into the community. A myriad of jobs needed to be done, such as finding adequate housing, enrolling children in schools, and organizing health checkups. While some of the refugees knew a little French, or had a smattering of English, language training was also essential. For the refugees, arriving in Ottawa represented a huge cultural shock, especially for those coming in the dead of winter, accustomed as they were to the tropical climate of Indochina. Even if greeted by eager sponsors, they had to orient themselves in a strange, city with unfamiliar food and customs in a foreign language. Mayor Dewar’s “call to arms” galvanized the city, and, indeed, the entire nation. Thousands of Ottawa citizens organized themselves into sponsorship groups. The Ottawa Citizen, discarding its role as an independent, dispassionate reporter of the news, helped residents form groups by printing a sponsorship form on the front page of the newspaper. 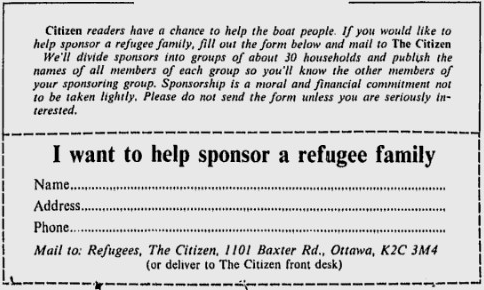 Anybody wanting to sponsor a refugee could send in the filled-out form to the Citizen which would then divide people into groups of about 30 households in the same neighbourhood. The newspaper stressed that sponsorship was “a moral and financial commitment not to be taken lightly,” and that only “seriously interested” people should send in a form. The newspaper also agreed to sponsor a refugee family and challenged other area businesses to do likewise. Citizens across Canada responded positively to the appeal to aid the refugees. In a flood of good will and compassion, more than 7,000 sponsorship groups were established across the country. In time for the UN conference held in late July 1979, the federal government under the leadership of Joe Clark increased the quota of refugees Canada was willing to take to 50,000 from 8,000—a politically courageous decision for a minority government. External Affairs Minister Flora MacDonald later said that the Project 4000 initiative was instrumental in persuading hesitant Cabinet colleagues to approve the huge increase. The following year, the quota was raised again to 60,000 in response to the overwhelming sponsorship demand. The winding down of Project 4000 did not stop the flow of Asian refugees to Ottawa, or to Canada more generally. When the torrent had slowed to a trickle by the late 1990s, more than 200,000 immigrants had come to Canada from Indochina. In contrast, there had been only 1,500 people of Vietnamese origin living in Canada in 1975, prior to the arrival of the boat people. By the time of the 2006 census, almost 60,000 residents in Ottawa-Gatineau identified themselves as having East or Southeast Asian roots. Successfully integrated into their new communities in all walks of life, the former boat people have greatly enriched the economic, cultural, and culinary fabric of the country. Marion Dewar was made member of the Order of Canada in 2002. She passed away in 2008, a year short of the 30th anniversary of the establishment of Project 4000. Buckley, Brian, 2008. Gift of Freedom: How Ottawa welcomed the Vietnamese, Cambodian, and Laotian refugees, General Store Publishing House, Renfrew. Canadian Council for Refugees, 1999. The Resettlement of Indochinese Refugees in Canada: Looking Back after Twenty Years, https://ccrweb.ca/20thann.html. Dorais, Louis-Jacques, 2003. From Refugees to Transmigrants: The Vietnamese in Canada, Laval University, paper presented at the 8th International Metropolis Conference, Vienna. Statistics Canada, 2009. Population by selected origins, by census metropolitan areas (2006 census), Montreal, Ottawa-Gatineau, http://www.statcan.gc.ca/tables-tableaux/sum-som/l01/cst01/demo27e-eng.htm. The Ottawa Citizen, 1979. “The Refugees: Waning concern main fear facing refugee co-ordinator,” 10 July. ———————–, 1979. “Overwhelming show of support,” 13 July. UNHCR, 2014. The People of Canada, Nansen Award Winners, 1986, http://www.unhcr.org/cgi-bin/texis/vtx/search?page=search&docid=4ad5dc559&query=1986%20nansen%20award. Ward, Bruce, 2008. “We’ll take them,” The Ottawa Citizen, 30 April. Images: “Boat People,” History Learning Site, http://www.historylearningsite.co.uk/vietnam_boat_people.htm. 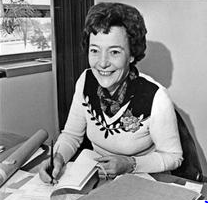 Mayor Marion Dewar in 1979, The Ottawa Citizen, http://www2.canada.com/ottawacitizen/features/boatpeople/index.html. Sponsorship Coupon, The Ottawa Citizen, 10 July 1979.